Several routes serving south Kansas City change in October 2017 to create connections at the 3-Trails Transit Center. The location at Bannister and Blue Ridge will serve as a hub for six RideKC routes: Troost MAX, 28 Blue Ridge, 29 Blue Ridge Limited (previously 28X Blue Ridge Express), 75 75th Street, 99 South KC Flex, and 399 Raytown Flex. The transit center opens Sunday, Oct. 1. Construction is expected to be completed by the end of October. 399: Blue Ridge Crossing, Mid-Continent Library, Raytown City Hall, Two Rivers Hospital. 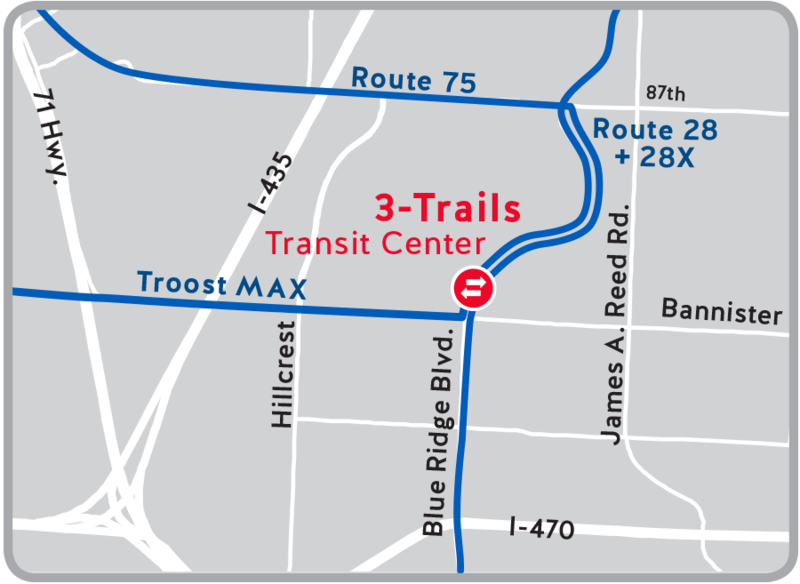 Troost MAX, 75 and 99 will all extend their current routes eastward to serve 3-Trails Transit Center. 28 will no longer travel on 87th, Bannister or Highway 435, and will stay on Blue Ridge Blvd. 75 will travel on 87th; Troost MAX will travel on Bannister. In order to connect to the transit center 75 will no longer provide rush hour trips to Johnson County locations such as Rosana Square and Town Center Plaza during rush hour. Instead, 51 will offer rush hour trips to and from this part of Johnson County. 51 and 75 will both continue to serve Ward Parkway Shopping Center. 51 does not serve 3-Trails Transit Center. Its destinations include Sprint Campus, Town Center Plaza, St. Luke’s South Hospital, Ward Parkway Shopping Center, Crown Center, Downtown KCMO, and Downtown Airport. 3-Trails Transit Center is named in honor of historical significance of the area. The new transit center has been designated by the National Park Service as a trailhead marking the California, Oregon and Santa Fe trails. For help planning a trip on an affected route, call the Regional Call Center weekdays between 6 a.m. and 7 p.m. at 816.221.0660.